Home › Mute swan › Whooper swan - Cygnus cygnus. The whooper swan (Cygnus cygnus) belongs to the family Anatidae. The whooper swan species is distributed in Europe and Asia. The swan species is a rare visitor to North America and Indian Subcontinent. Cygnus cygnus species are considered closely related to C. buccinator. The whooper swan species is a large bird, the male swan measuring 140 to 160 cm in length and weighing 7,000 to 15,500 grams. The female is smaller and weighs 5,500 to 13,000 grams. The wingspan is 200 to 240 cm. The plumage is white and the bill yellow and with a black tip. The legs are black. The head is angular in shape. Whooper swans have a deep honking call and are powerful fliers. The breeding whooper swan species prefer water bodies with abundant emergent vegetation. They inhabit shallow freshwater pools, lakes, slow-flowing rivers, marshes and swamps. The wintering birds occur in lakes, lagoons, coastal bays, estuaries and flooded grasslands. The whooper swan species are entirely vegetarian, feeding on seeds, shoots, fruits, leaves and bulbs of the aquatic plants and grasses. These swan species breed during April and May. These species are monogamous and pair for life. The nest is a large mound of plant matter. The nest is constructed on dry land or on reed beds. The female usually lays 4–7 eggs and incubates. The male swan guards the nest and the female. The whooper swan species are distributed in Northern Europe, Iceland, Scandinavia and Siberia. They winter in West and Central Europe, Baltic , North, Black, Caspian and Aral Seas, Coastal China and Japan. Some vagrant birds visit the Indian Subcontinent and North America. These swan species are highly migratory, migrating to wintering grounds from September to October and arrive at the wintering sites by October or November. The species migrate to the breeding grounds again from March to April. However, part of the Icelandic population is resident. The global population of whooper swan species is estimated to be nearly 180,000 individual birds. These swan species have wide range and are considered least vulnerable. Lead poisoning by ingesting lead shot and lead fishing net weights, entanglement in the fishing nets, pollution, human activity and habitat destruction are the major threats in conservation. 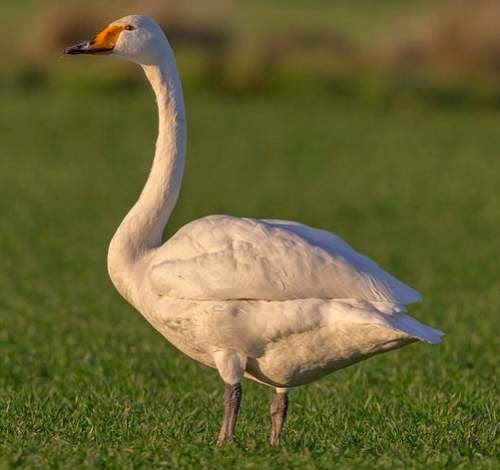 The IUCN (International Union for Conservation of Nature) has categorized and evaluated these whooper swan species and has listed them as of "Least Concern". Current topic in Birds of India: Whooper swan - Cygnus cygnus.